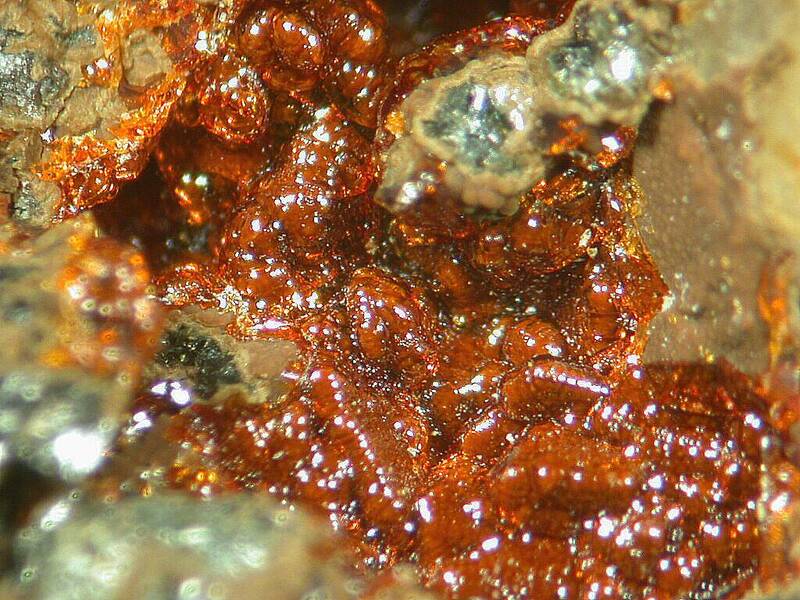 Diadochite: Mineral information, data and localities. Yellow to greenish-yellow or brown, reddish brown, light green, light yellow; pale yellow to yellowish brown in transmitted light. Named in 1837 by Johann Friedric August Breithaupt from the Greek διάδοχος for "successor," presumably in allusion to its secondary origin. 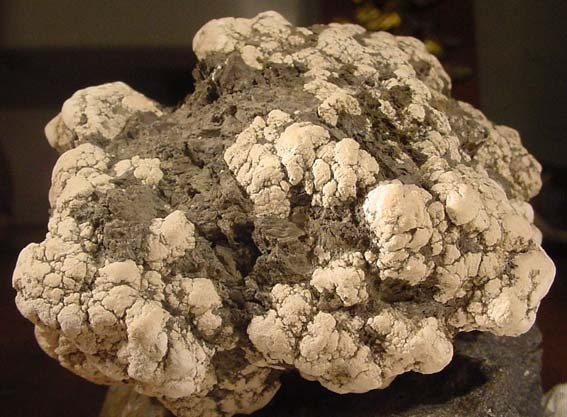 A secondary mineral occurring in gossans and coal deposits as the result of sulfate-rich solutions reacting with earlier phosphates; common in secondary phosphate assemblages in granitic pegmatites; in cave deposits, or as a post-mining product. Lustre dull in earthy material, waxy, horn-like in gel masses. Isotropic when glassy. Measured 2V = small. Found as nodules or colloform crusts, massive; glassy, earthy. Mining Academy, Freiberg, Saxony, Germany: #20765. Slate altered by ground water, perhaps originally post-mine in occurrence. Jahnsite A generic name for a number of difficult to distinguish members in the Jahnsite Subgroup. 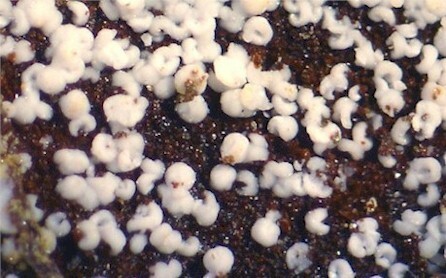 Cacoxenite 2 photos of Diadochite associated with Cacoxenite on mindat.org. Schoonerite 1 photo of Diadochite associated with Schoonerite on mindat.org. Strunzite 1 photo of Diadochite associated with Strunzite on mindat.org. Fluellite 1 photo of Diadochite associated with Fluellite on mindat.org. Breithaupt (1837) Journal für praktische Chemie, Leipzig: 10: 503 (as Diadochit). Feistmantel (1873) Lotos: 23: 33. Rammelsberg, C.F. (1875) Handbuch der Mineralchemie. second edition: 331. Carnot (1880) Bulletin de la Société française de Minéralogie: 3: 40. Cesàro (1885) Mém. Soc. belge geol. : 12: 173. Dana, E.S. (1892) System of Mineralogy, 6th. Edition, New York: 867. Cesàro (1897) Mém. Ac. Sc. Belge: 53: 1. Cornu (1909) Centralblatt für Mineralogie, Geologie und Paleontologie, Stuttgart: 330 (as Geldiadochite). Cornu (1909) Zeitschrift Chem. Ind. Kolloide: 4: 17 (as Geldiadochite). Larsen, E.S. (1921) The Microscopic Determination of the Nonopaque Minerals, First edition, USGS Bulletin 679: 67. Ulrich (1922) Rozpr. České Ak. : 31: no. 10. Hintze, Carl (1931) Handbuch der Mineralogie. Berlin and Leipzig. 6 volumes: 1 [4B]: 750, 755, 1073. Mélon and Donnay (1936) Bulletin de la Sociètè Belge de Gèologie: 59: B162. Rogers (1938) American Mineralogist: 23: 178. McConnell (1942) American Journal of Science: 240: 656. Van Tassel, R. (1985) Mineraux phosphates secondaires (vashegyite, destinezite [= diadochite], wavellite, crandallite, phosphate de fer) a Haut-le-Wastia, province de Namur (Belgique). Bull. Soc. Belge G´eol., 94, 19–27 (in French with English abs.). Gaines, Richard V., H. Catherine, W. Skinner, Eugene E. Foord, Brian Mason, Abraham Rosenzweig (19 ), Dana's New Mineralogy : The System of Mineralogy of James Dwight Dana and Edward Salisbury Dana: 966. Peacor, D.R., Rouse, R.C., Coskren, T.D., and Essene, E.J. (1999) Destinezite ("diadochite"), Fe2(PO4)(SO4)(OH)·6(H2O): its crystal structure and role as a soil mineral at Alum Cave Bluff, Tennessee, Clays and Clay Minerals, 47, 1-11. Jambor, J.L. and A.C. Roberts (2000) New Mineral Names. American Mineralogist: 85: 263-266. Hey's Mineral Index 3rd ed. Palache, C., Berman, H., & Frondel, C. (1951), The System of Mineralogy of James Dwight Dana and Edward Salisbury Dana, Yale University 1837-1892, Volume II: 1013. Palache, C., Berman, H., & Frondel, C. (1951), The System of Mineralogy of James Dwight Dana and Edward Salisbury Dana, Yale University 1837-1892, Volume II: 1013; Prachař, I.: Současný stav výskytu nerostů ve Chvaleticích. Acta musei Reginaehradecensis, série A: vědy přírodní, 1981, roč. XVI., s. 99-102. Palache, C., Berman, H., & Frondel, C. (1951), The System of Mineralogy of James Dwight Dana and Edward Salisbury Dana, Yale University 1837-1892, Volume II: 1013; Jirásek, J.: Nález koninckitu u Litošic a jeho srovnání se světovými výskyty. Bulletin mineralogicko-petrografického oddělení Národního muzea v Praze, 2005, roč. 13, s. 132-137. Dana, E.S. (1892) System of Mineralogy, 6th. Edition, New York: 867; Palache, C., Berman, H., & Frondel, C. (1951), The System of Mineralogy of James Dwight Dana and Edward Salisbury Dana, Yale University 1837-1892, Volume II: 1012. Lacroix, A. (1910): Minéralogie de la France et de ses colonies, Librairie Polytechnique, Ch. Béranger Editeur, Tome IV, 600. Palache, C., Berman, H., & Frondel, C. (1951), The System of Mineralogy of James Dwight Dana and Edward Salisbury Dana, Yale University 1837-1892, Volume II: 1012; R. PIERROT, L. CHAURIS, C. LAFORET (1973) : "Inventaire minéralogique de la France : 29- Finistère. ", B.R.G.M. Paris. DILL, H.G., MELCHER, F., GERDES, A. and WEBER, B. (2008): The origin and zoning of hypogene and supergene Fe-Mn-Mg-Sc-U-REE-Zn phosphate mineralization from the newly discovered Trutzhofmühle aplite (Hagendorf pegmatite province, Germany). Canadian Mineralogist 46, 1131-1157. Palache, C., Berman, H., & Frondel, C. (1951), The System of Mineralogy of James Dwight Dana and Edward Salisbury Dana, Yale University 1837-1892, Volume II: 1012. Szakáll, S., Földvári, M., and Kovács, Á. (1994): Phosphate minerals from Recsk and Parád-Parádfürdő ore deposits (N-Hungary). Folia Historico Naturalia Musei Matraensis, 19, 23-36. Matsubara, S., Miyawaki, R. & Iwano, S. (1999): Diadochite from the Hinomaru-Nako mine, Yamaguchi Prefecture, Japan. Bull. Natn. Sci. Mus., Tokyo, Ser. C, 25, 51-57. Sparrow, C. (1989): Russell Society Newsletter 3, 6; Golley, P., and Williams, R. (1995): Cornish Mineral Reference Manual. Endsleigh Publications (Truro), 104 pp. ⓘ Isom Avants pits ? Palache, C., Berman, H., & Frondel, C. (1951), The System of Mineralogy of James Dwight Dana and Edward Salisbury Dana, Yale University 1837-1892, Volume II: 1013; Rogers, Austin Flint (1938a), Diadochite, a mineraloid from the New Idria mine, San Benito County, California: 178; Pemberton, H. Earl (1983), Minerals of California; Van Nostrand Reinholt Press: 312. Schooner (1961); Januzzi (1976) p. 234. Coveney, R.M., A.V. Allen, J.C. Blankenship & W.B. Simmons (1984) Hawleyite and phosphate minerals from Bethel Church, Indiana, including a second occurrence for ferrostrunzite: The Mineralogical Record: 15: 351-357. Gleba, 1978. Mass. Mineral & Fossil Loc. ⓘ Chesley Mountain prospect ?